a Challenge from an Inland Lake! Lake Kashiba is a ‘gigantic sink hole’ and a scuba diving challenge. Many mystical stories and legends surround its existence. The lake is unique, natural and serene. It is located in an unspoiled wilderness. This beautiful and awe-inspiring lake provides a natural pleasure resort to the visiting public and the local population on the Copperbelt of Zambia. Lake Kashiba is situated southwest of Ndola town in the Copperbelt Province. It is accessible by an asphalt road more than three quarters of the way and by an all weather laterite road the rest of the way. The lake is populated by a variety of fish species while the surrounding mushitu forest is home to many birds. The beauty of the lake is further accentuated by the blueish hue of the water giving it the visual impression of a gigantic natural swimming pool, with no visible river entering or leaving it. 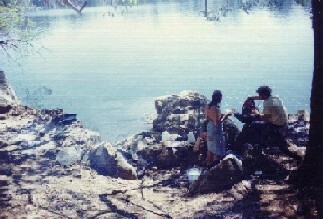 The physical layout of the lake is unique. It is rectangular in shape and bordered by high vertical cliffs. The water line is lower than the surrounding land surface. The sunken lake is the result of the karsts topography formed from the weathering of limestone. The lake was formed millions years ago. It is a result of the seepage dissolving the underground limestone bedrock through a chemical process involving Carbonation of Calcium Carbonate in limestone by dilute Carbonic acid. 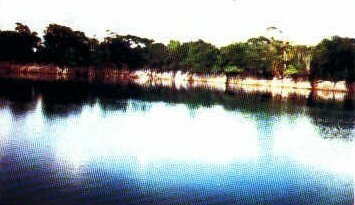 The lake is very deep and the water does not fluctuate much, only a minor rise during the height of the rainy season. With its dimension of 800 metres in length it has a depth of 100 metres on the sides. However, the depth at the center of the lake is unknown. For this reason Lake Kashiba is the scuba diving ultimate challenge. 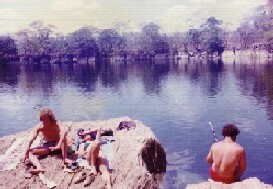 A proper scuba diving “nightmare?” The lake is popular for scuba divers who attempt to establish the depth of the lake. Alas, …this challenge has remained unattainable, or has it? But check who did it . According to local traditions and legends, it is believed that if a canoe were sent drifting across, it would be sucked under. It is also believed that all the leaves, which fall on the water by the day, are sucked under at night by some unknown force. It is believed that this explains the clean and very clear water of Lake Kashiba, a scuba diving nightmare? Plunge in, take on the challenge and be the first to reach the bottom of this small inland lake. If this is not your cup of tea then you’re in luck. Please click here to visit the Adventure Centre in Livingstone to choose your taste of adventure.